This new Amex offer could help you save on an upcoming hotel stay: a $50 statement credit after you spend $250+ at Hilton Hotels and Resorts. Amex offers are opt-in, limited-time targeted deals (meaning you’ll only see the offers on some of your Amex cards). To add the offer to your card, first log on to your American Express account, scroll down to the “Amex Offers and Benefits” section, and add the offer if it’s listed. We found it on our Platinum Card from American Express, Hilton Honors Card from American Express and The Business Platinum Card from American Express OPEN. Luckily, this offer is also available via Twitter. 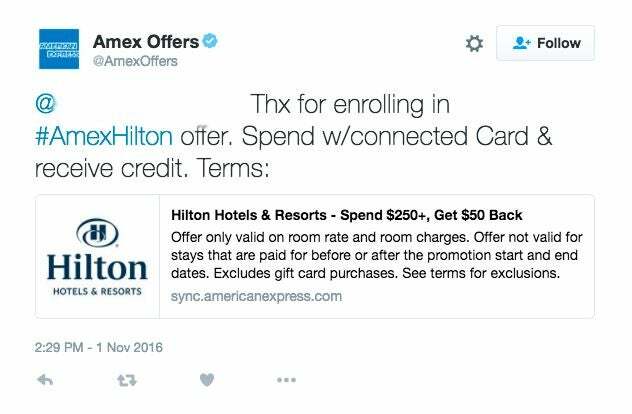 To opt in, just link an American Express card to your Twitter account, tweet #AmexHilton, and wait for a confirmation message from @AmexOffers that the offer has been added to your account. The $50 statement credit is applied only to the card connected to the Twitter account used or the card with the offer added and will be applied to any $250+ spent on the room rate or room charges when you pay for your stay between 11/1/2016 and 12/31/2016. The offer is only valid at Hilton Hotels and Resorts in the US and US territories. The offer is not valid at Waldorf Astoria, Conrad Hotels, DoubleTree, Embassy Suites, Hilton Garden Inn and some other brands in the Hilton portfolio. Check out the full list in the terms and conditions. The credit should appear on your statement within 90 days of the end of the promotion (though in our experience, it appears within the billing period). And make sure to check your accounts for other great offers, like this one for $60 back when you spend $200+ at Hyatt Hotels in the US. Featured image courtesy of the Hilton Sedona Resort at Bell Rock.